Dental X-Rays are an integral part of providing treatment, x-rays provide dentists with insight into the structure and layout of a patients teeth allowing them to provide them with the best possible care. 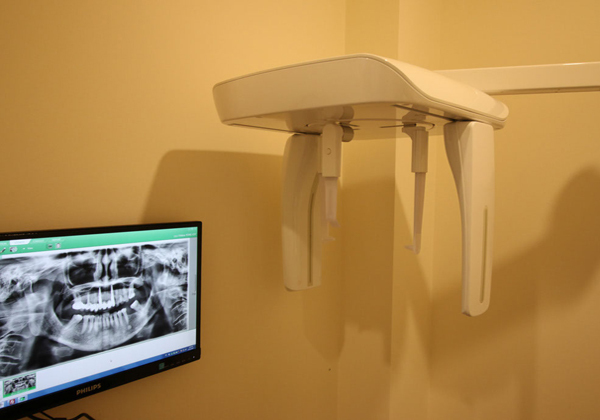 At Purity Dental we offer two types of dental X-Rays – the OPG and CBCT. Speak to our expert dentists to find out which one is most suitable for your treatment. X-rays use radiation to take pictures of bones and other parts inside the body. An OPG is a panoramic X-ray of the upper and lower jaws, including the teeth. The OPG unit is specifically designed to rotate around the patient’s head during the scan. An OPG will take approximately 20 seconds. It can also be used for surgical planning. Cone beam computed tomography (CBCT) is a medical imaging technique consisting of X-ray computed tomography where the X-rays are divergent, forming a cone. CBCT offers an undistorted view of the dentition that can be used to accurately visualize both erupted and non-erupted teeth, tooth root orientation and anomalous structures that conventional 2D radiography cannot.